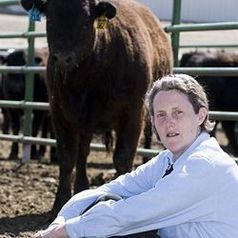 A professor of Animal Sciences at Colorado State for more than 20 years, Grandin lectures internationally on autism and livestock handling. Her insights into animal behavior and her innovations in livestock handling have revolutionized food-animal welfare. She was named by TIME magazine as one of "100 Most Influential People in the World" in 2010. Her life story was the subject of the a 2010 HBO biopic, "Temple Grandin," winner of seven Emmy awards and a Golden Globe.